Conveniently located in the heart of Adelaide city, Mansions on Pulteney offer boutique style studio and one bedroom apartments and is walking distance to the cosmopolitan Rundle Street featuring a variety of cafés, restaurants and boutique shopping. Arriving late Why not take advantage of our continental breakfast packs and pantry shopping available on request. Charge back facilities are also available at our onsite restaurant and bar open Monday-Friday for lunch and dinner, room service also available. 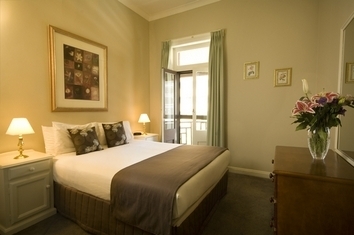 Mansions on Pulteney is ideal for short stays whether it be business or personal, right through to long stays for relocation and family holidays. Located in the central business district and close to the Universities, Royal Adelaide Hospital, Botanic Gardens, Adelaide Zoo & Rundle Mall. Guests enjoy comfortable living with many facilities at their fingertips. 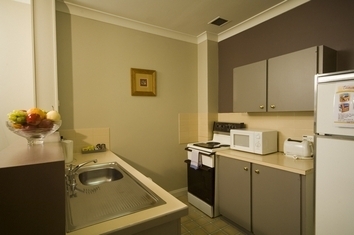 All apartments contain living/dining area, fully equipped kitchen including microwave, oven and hotplates apartment controlled reverse cycle air conditioning iron & ironing board direct dial phones FOXTEL & wireless internet connection. This historic building from 1912 still boasts many original features including high ceilings, spacious rooms and most apartments feature balconies. Perfect for the corporate or long-term traveller with a maximum occupancy of 3 adults. Queen bed & most apartments also feature sofa beds for an additional guest or twin share. Apartment features separate bedroom, lounge/dining/kitchen area. Combined bath & shower in the bathroom. Opening windows & private balcony for those preferring the fresh air. Perfect for families, twin share or those looking for some additional space with a maximum occupancy of 4 adults. Queen bed, single bed & most apartments also feature sofa beds for an additional guest. No stairs to these apartments, great for those with mobility difficulties or new mums with prams. Apartment features separate bedroom, lounge/dining/kitchen area. Combined bath & shower in the bathroom. Opening windows & private balcony for those preferring the fresh air. Purpose designed for the single, double or short term traveller with a maximum occupancy of 3 adults. Queen bed & some apartments also feature sofa beds for an additional guest or twin share. Apartment features separate bedroom, lounge, kitchen/dining area. Quiet apartments situated at the back of the building with opening windows throughout the apartment (no balcony). Shower only in the bathroom. Purpose designed for the single traveler with a maximum occupancy of 3 adults. Queen bed & some apartments also feature sofa beds for an additional guest or twin share. Beautiful open plan design with no compromise on space. No stairs to these apartments, great for those with mobility difficulties or new mums with prams. Combined bath & shower in the bathroom. Opening windows & private balcony for those preferring the fresh air. Wireless internet available to all apartments, charges apply. Most apartments feature sofa beds for an additional $30.00 per night. Must be arranged prior to arrival. Secure Car parking is located directly across the road from Mansions on Pulteney . The cost of parking is $16 per night with unlimited 24 hour access (Height restriction 2.1m). Entry passes must be arranged at reception on check in. There are designated 10 min loading zones in the lanes located on both sides of Mansions on Pulteney which can be used to unload luggage and check in. Adelaide Domestic and International Airport terminals are located only 9km from Mansions on Pulteney , a short 15 minute taxi ride from the hotel. From the airport turn right onto Sir Donald Bradman Drive and follow this road to the city centre.Turn left at West Terrace, then right at North Terrace and right into Pulteney St (3 blocks). Immediately on you right you will see Mansions on Pulteney. 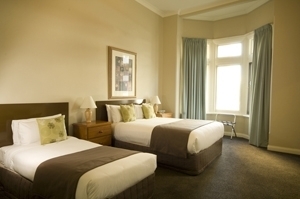 Mansions on Pulteney is located just 7 km from the Adelaide International and Domestic Airport. Step outside our front door and find yourself at Rundle Mall featuring over 600 retail stores. For more shopping, hop on the bus to Harbour Town, Adelaide's outlet shopping precinct. Visit Adelaide's cultural boulevard including the South Australian Museum, Art Gallery, State Library, Migration Museum and Tandanya Multi Arts Centre - all within walking distance. 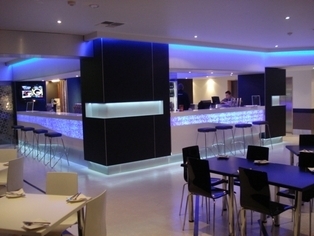 Alfresco cafes, restaurants, clubs and bars are all at your fingertips for a fun night out. Tour guides will pick you up at your door for day tours throughout the Adelaide Hills, Barossa Valley, city sights and Glenelg beach. For those with extra time, why not visit Kangaroo Island by the Sealink ferry.